Donald Trump's campaign is pushing to reschedule two of the presidential debates set for this fall, but the Commission on Presidential Debates, the nonpartisan group responsible for scheduling, is standing firm. "Our position on the debates is we want as many people, as many voters, to be participants in and to see the debates as possible," Jason Miller, senior communications adviser with the Trump campaign, said on CNN's "Reliable Sources" Sunday. The campaign is concerned that two of the three presidential debates are set to take place on the same nights as nationally televised NFL games. The debate scheduling process is always difficult. Debates and football games have overlapped numerous times before, including twice in 2012. In a statement on Sunday afternoon, the commission indicated that the dates will not be changing: "CPD believes the dates for the 2016 debates will serve the American public well." One hour later, Hillary Clinton's campaign signaled that it has no problem with the calendar. "This is just more Trump debate malarkey," Clinton campaign chair John Podesta tweeted. "We will be at the debates set by the bipartisan debate commission and expect he will too." Trump has not said that he'll skip the debates. Instead, he and his allies have questioned the fairness of the scheduling. The Republican candidate started a debate over the debates on Friday, when, in a tweet, he accused Clinton and the Democratic party of "trying to rig the debates." 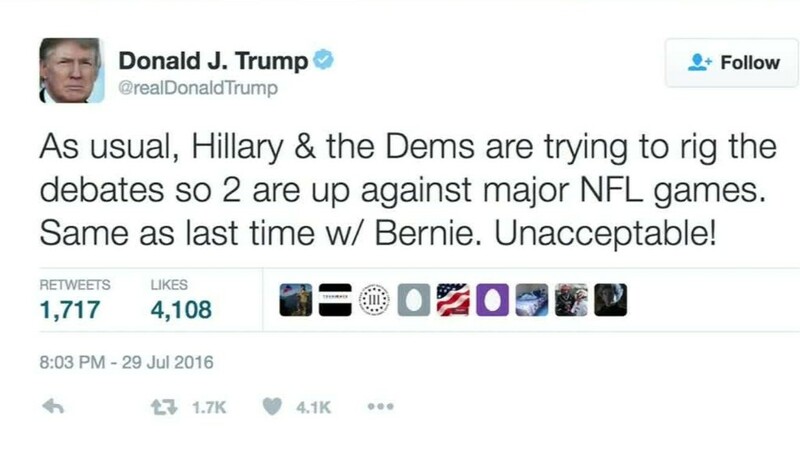 Two of the debates "are up against major NFL games," Trump tweeted. "Same as last time w/ Bernie. Unacceptable!" In fact, the nonpartisan commission -- not the Democratic party -- selected the dates. The schedule was announced in September 2015. Miller was asked on "Reliable Sources" whether Trump would seek to change the schedule when it talks with the commission in the coming weeks. "We would like the debates to not be head-to-head against major NFL games. That's something we'll be discussing as we go into negotiations," Miller said. "We think it's only right that as many people are able to watch the debates as possible." The debate organizers agree that access to the debates is important, but they note that the forums are easy to find all across TV. People who choose to watch the football games live can still watch the debates later via DVRs, video-on-demand and web streams. The commission took an unusual step by defending itself in detail through its Sunday afternoon statement. "The [CPD] started working more than 18 months ago to identify religious and federal holidays, baseball league playoff games, NFL games, and other events in order to select the best nights for the 2016 debates," the group said. "It is impossible to avoid all sporting events, and there have been nights on which debates and games occurred in most election cycles. A debate has never been rescheduled as a result." NFL games are played on Sundays, Mondays and Thursdays in the fall. Fridays and Saturdays are effectively ruled out because TV viewing is lower on weekend evenings. That leaves only Tuesdays and Wednesdays, which themselves may be affected by baseball's World Series. The commission seeks to space out the debates and schedule them for different nights of the week. In a thinly veiled attempt to say that debates matter more than football, the commission noted that more than 1,000 NFL games are played every four years, versus just four general election debates over that same period. Furthermore, the commission said it purposefully announces the debate dates a year ahead of time "in order for the television networks to have maximum lead time and predictability." Trump acted as if the dates were news, however. In an interview with ABC News, Trump said of the debate scheduling, "I got a letter from the NFL saying, 'This is ridiculous.'" The NFL denied that. "While we'd obviously wish the debate commission could find another night, we did not send a letter to Trump," a spokesman said. On "Reliable Sources," Miller said Trump had been notified of the overlap by a "source close to the league." He dismissed any question over whether Trump had actually gotten a letter from the NFL as "semantics." Another Trump aide asserted that "millions of voters" will be "disenfranchised by these chosen dates." Because Trump skipped one of the GOP primary debates in January, there has been speculation among observers that he may quibble with the fall debate schedule or even threaten to not show up. But it would be risky for Trump to turn down the debates. Voters consistently tell pollsters that the sessions help them decide which candidate to support. Campaigns routinely haggle over the details of the debates, right down to the temperature of the studio, but every major party candidate in modern times has ultimately agreed to participate. RNC officials backed up Trump's debate scheduling objections on Saturday and Sunday. And Trump ally Newt Gingrich, who was on the short list to become Trump's vice president, tweeted that the NFL conflict "makes me think the commission is rigged to help hide Hillary from the voters." The commission is led by both Republicans and Democrats. It has organized general election debates for three decades.